Because we use email for many different purposes we often have to deal with multiple email accounts, addresses and devices e,g laptops,smart phones etc. For example, you may have a work email account, and also a private email account that you need to access. You might also need to access your email from different locations and on several devices. What is the best way to manage these accounts? How do I get all my emails in one place? Should I have separate email accounts? How do I access my email on my PC and smart phone? Here we will look at some simple strategies you can use to manage and access email from multiple email accounts. So for illustration purposes lets take Joe. Joe has three email accounts and three email addresses. There are various ways that Joe can manage and accesses these accounts. What will be the best way depends on what email client and device Joe wants to use, and whether or not he needs to keep the email in the different accounts private and/or separate. Joe could decide to keep his email accounts separate. To do this he could simply access each mailbox separately by using Web mail to login to each account. The accounts would all need to support Webmail access. Using this method the email management and access is kept completely separate.. If you have multiple accounts from the same provider i.e. 2 Gmail accounts then you cannot open two accounts at the same time in the same browser. A simple solution is to use a second browser e.g. Chrome to access one account, and Firefox to access the other account. If you use the Google Chrome browser then you could create two chrome accounts and use one account for one mailbox and the other chrome account for the other. If you want all your email in one place then you need to consolidate the email accounts. Although certain methods will keep the email separate there are privacy issues that you need to consider when you consolidate email accounts. There are three main methods available:. Use an on line client / Account to consolidate the emails. Use Email forwarding to a single main Email Account. Desktop email clients like outlook,outlook express and Apps (tablets and phones) can be configured to access multiple email accounts at the same time. They do differ in how they present the email. 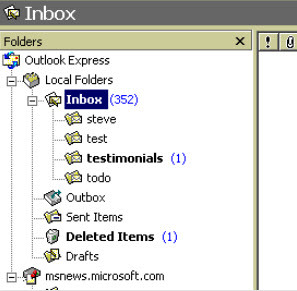 Some clients keep the emails separate while others use a single universal inbox. You should notice that only one inbox is present even though the client is accessing multiple mailboxes/addresses. 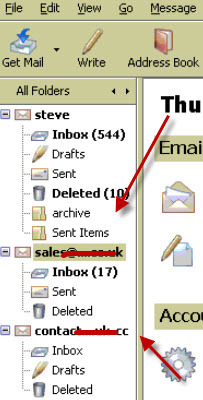 All mail appears in the Universal inbox which means that you will need to find another way of separating it (e.g. message rules). Note: The email access protocol POP3 or IMAP4 affects how the email is presented. You can manage multiple email accounts online by using a Yahoo,Gmail or outlook.com mailbox to consolidate the email. This method is similar to the desktop client consolidation except it is done on the email server. In essence they function as POP3 email clients by reading the email from the other accounts and placing the email into the inbox of your online account. In our example above Joe could use his Yahoo.com account as the single location for his email. He then configures his account to read email from the other two email accounts and place it into his Yahoo.com inbox. Note: -It is important that you only use the main account to send emails if you want all of your sent emails to be available in the one account. This is a common technique when moving email addresses, and is normally used as a temporary measure. It can also be used for consolidating email into a single mailbox especially for email accounts that aren’t used very often. You could arrange for all email to the different addresses to be automatically forwarded to a single address/account. You now need only to access the Yahoo.com account using either Webmail or an email client, and you can read and respond to email sent to any of the three email addresses. See Automatic mail forwarding for more details. PCs and mobile devices can run multiple email clients. For example you could install and configure Outlook,Windows live mail ,Thunderbird etc on the same PC. Each of these clients can be used to access an email account. This method has the advantage that all email is kept separate but you will need to get familiar with several different client interfaces. Joe could choose to consolidate the Yahoo email account and the ISP email accounts as they are personal, and don’t need to be kept private or separate. Joe could use the Yahoo Email service to consolidate the email or an email client like outlook. Joe could access the business account using webmail or a email client App that wasn’t being used for accessing the other accounts. If you consolidate email accounts using a master mailbox then the master account contains all of your emails, and would allow an hacker easy access to all email accounts if it were compromised. Q- Is it better to use an email client rather than a online account to consolidate email from Multiple accounts? A- It all depends on your preferences, but using an online master email account means that all your email is available in one place and from anywhere in the world using a web mail client. Q- If I consolidate the email in a master online mailbox e.g. Gmail what happens to email sent to the original mailbox? A- It depends on how you setup the master online account to access the mailbox. Usually you will leave it in the original mailbox. In which case you will effectively have two copies. Q- I’ve consolidated all my email on Gmail but my email messages take a long time to appear in my Gmail account? A- This is normal as Gmail needs to connect to the original mailbox to retrieve the mail. It does this on a scheduled basis which you cannot change. This is probably the biggest problem of using this method. Q- If I consolidate all my email on Gmail where is the email that I send stored? A- When consolidating email addresses you need to send email from a single account.i.e. your Gmail account. It is then stored in the sent items of you Gmail account.